Learner are the people that will be using the e-learning course, app, touchscreen, Learning Management System (LMS), website, intranet or the project that going to be delivering. It will help the success of your project if you can involve them soon as possible. Quite often learners only see the course when it has been delivered. Think about how you can involve learners in your project. Think about including some learners in your project team, they will often provide insight into what has previously been a success and what is not liked from the learner perspective. Can you use online survey applications like survey monkey to get feedback from learners about what they expect from your course, you can also get great feedback from the course after it has been implemented. Anonymous feedback can also be used to get better response in some instances. Ask learners what they have liked about other e-learning courses that they have used in the organization that you are working in. You’ll often get great feedback on the content, interface and design of previous courses. It might not be possible to incorporate all of the feedback but you’ll have some invaluable feedback that you can include in your design. Ask your client if they have already completed user feedback questionnaires as this data may already be available for you to review. Can you set up a review session with some learners with the client organization? Set up a session with a small number of learners and ask them their opinions of the current e-learning courses, if the client doesn’t currently have any e-learning courses you can ask them about any courses that they might have completed in other jobs. Bring along some demo courses for them to review. You might get some interesting feedback from the learner group. When you start a project you should ask for the technical, design and content guidelines from the client. If you are lucky these will already be available, some companies have e-learning guidelines that cover all of these elements in one document. At the very least you will normally be able to get hold of a design guidelines document that will help with graphic design and brand guidelines as you start designing the interface of your e-learning project. If the client doesn’t have these documents suggest that you start creating them. They will be useful for the client in the future; they should be dynamic documents that change with the needs of the organisation. You might find that the client will even pay you to create the documents for them! If e-learning guidelines don’t exist it is useful to create your own documents for the purpose of your project – you need to understand the technical, design and content guidelines and have them agreed with the project team before you start the project. Speak to the people in the relevant departments to get their input. Once you have the technical, design and content guidelines make sure that the right people have reviewed them, you don’t want to have any surprises later in the project. Check that there you have asked all of the key stakeholders and directors within the client business who will want to have input in these documents. Possible people who will want to be involved are the Marketing Director and the IT Director. Many projects have been created and passed many project checkpoints only to be changed at final delivery as they have not been reviewed by Senior Directors or Managers. This final sign off will be important for organisations who could be sending our your project to thousands of their employees, sometimes worldwide, they want to ensure that the brand is portrayed in the right way. You will have probably been sent a tender document or email from the client already, sometimes this might have only been a few lines of an email othertimes it will be a tender document. It is a good idea to agree the project specification before you start and even before you write your tender or proposal response. You need to know what the project requirements are. If you have any questions you should get clarifications from the client or potential client. It is difficult to prepare a tender or specify a project without the right project information. What is the audience? Who is it for? What is the platform? Mobile, PC, Mac? Why are you developing the project? Do you have any e-learning guidelines that we can review? These are just a few sample questions that you can ask the client. It is important that you understand the client requirement before you start the project. You need to understand the technical, learning and design requirements of the project; it makes sense to have those from the client before you write your tender or specification document. Often the client will have an idea of what they require even if they are not documented, try and call the client or email your questions to them. You’ve been working well for several weeks, the script has been signed off, the designs look great and you’ve just created your first version of your course. You email over details of the course and wait for the feedback from your client – you then get and email from what you thought was the client telling you that they need to have the version reviewed by their ‘client, director, CEO, etc’. Get it documented who the client is and who is responsible for sign off at the start of the project. Naturally you will want to help your client but if you get change requests from outside of your project team you can refer to your project documents and deal with them accordingly. You should also make this clear to your client so that they can ensure that any stakeholders, directors and managers are aware of the change and project process. This can help later in the project when people want to be involved. As well as understanding who the client is make sure you know who is their deputy. If your project runs over more than a few weeks then they are likely to have time away from work, you need to know who you should ask if you need a decision in their absence. You don’t want to be waiting for them to return and holding up your project. When your client returns make sure you updated them of any decisions that have been made in their return and provide them with an update report even if they are not due for you – it will help you and your client! At the start of the project spend some time speaking to your customer about what type of report that they need for their directors and stakeholders. You can then agree on the format and type of reporting that you can produce, you can also agree how often you can produce your reports. There are many software tools that will help you produce your reports and also help you manage your project. For years Project Managers have used MS Project but many know prefer online tools like Basecamp that allow for online collaboration and also online sharing of files. Basecamp also makes it easier to to collate all of your project communication and back up up your project files at the end of the project. For smaller projects you can look at tools like minigroups or create something in Excel. When you are creating your reports it is important that you keep sending your reports to your team on a regular basis and ensure that the dates on each report are clear. Think about a simple summary note that explains any changes to the reports to make it easier for the project team to understand the report that you have sent over. 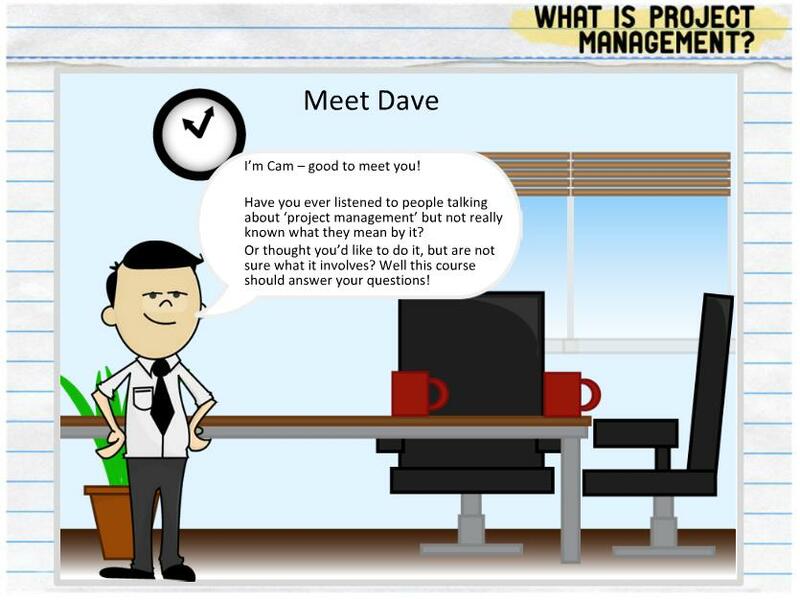 Before you start sending over reports to your project team think about speaking to you project team about the types of project documents that you team require on their e-learning project. Some clients will have specific requirements; some clients may never have received reports! You also need to be prepared that some clients will not like the process, reports or tool that you use. Be prepared to change! I’ve used most of the Project Managament tools and I’ve never had a project where everyone has liked them all. Some like MS project, some don’t. In recent years I’ve been using Basecamp as I’ve found it very easy to use, the web interface allows everyone to access it via a web browser and the reports are really easy to use – despite this some clients still don’t like it. In that case you need to be flexible and think of a way to prepare a new report for them and keep them engaged in your project, normally there will be a way or providing them with a report via email. Think about showing your clients your reports and project software at the start of the project, a short demo will help you and your clients throughout the project. ← Why you are wrong to dismiss short bursts of content?